‘Jindabyne’ is a new movie by Ray Lawrence, the acclaimed director of ‘Lantana’ and ‘Bliss’. The story of a group of men who discover the body of a murdered woman while on a fishing trip has been adapted from a short story by Raymond Carver. The story, ‘So Much Water So Close To Home’, has been used in film before. The 1993 Robert Altman movie ‘Short Cuts’ featured an adaptation of this story. But on that occasion it was only one of a dozen or so Carver stories included in the movie, with its large cast and multiple interwoven storylines. By devoting an entire movie to the story Lawrence is able to take his time developing themes and ideas. There are observations on parenthood, grief, love, spirituality, male-female dynamics, amongst others. And by making the murdered woman an indigenous Australian, the film is able to explore cultural differences, prejudice, and reconciliation. There is actually too much going on, and one of the faults of the film is its inability to tie everything up satisfactorily. 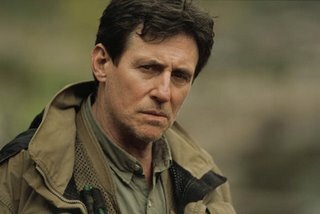 The two lead actors, Gabriel Byrne, an Irishman, and Laura Linney, an American, blend in well with the cast of Australian actors that populate the small Snowy Mountains town of Jindabyne. They play Stewart and Claire, a husband and wife already battling to hold together a fragile marriage. Stewart’s discovery of the body, and his subsequent actions push them both to breaking point. Byrne, in particular, excels as a man grappling with feelings of guilt and denial. Of the Australians, Deborra-lee Furness stands out as Jude, the wife of one of the fishermen, struggling to mask her own doubts and vulnerabilities, while John Howard offers stoic support as her husband, Carl. Other familiar faces include Chris Haywood, Charles Tingwell (in a brief cameo) and Max Cullen. Haywood’s role as the girl’s killer is one of the film’s major mis-steps. By not only identifying the killer, but also getting him to interact with Claire, Lawrence creates an unnecessary distraction. On a couple of occasions you feel the film is almost about to morph into a Hitchcock thriller. For me, the other mistake is the sub-plot involving Stewart and Claire’s son, Tom (Sean Rees-Wemyss), and Jude’s difficult granddaughter, Caylin-Calandria (Eva Lazzero). The moments spent with the children are among the weakest in the film. But there are many more effective moments to offset these, including some fine scenes with Byrne and Linney. The other ‘star’ of the show is the Snowy Mountains landscape. Ray Lawrence is particularly skilled at using landscape as a tool, often to illustrate or accentuate the feelings of his characters. The film ends with a reconciliation of sorts as the major characters gather with the indigenous people to mourn the death of the young woman. Given the prejudice shown by some of the townspeople, such a development seems unlikely, however, it does give the film some sense of closure. ‘Jindabyne’ is not a complete success, and those thrilled by ‘Lantana’ are likely to be disappointed. But it is a beautiful looking film containing many fine performances, and a welcome addition to the current crop of quality Australian films. My husband and I have just been to see this movie tonight and I must agree with some of your comments. It is indeed a beautiful movie with some brilliant performances. However, it does leave you ‘hanging’ I feel and the interaction between Claire and the killer is almost pointless and yes, the scenes with the children are a bit empty. But, all in all a great Aussie flick! Beats any American Hollywood crap!